This textbook of cave diving published in 2008, with 56 chapters by 35 authors filling 320 pages, offers a wealth of information to the newly certified or experienced cave diver alike. It is the most up-to-date and complete collection of practical and technical information currently available. 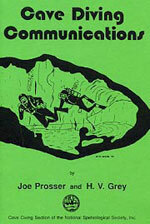 Chapters include history, geology, biology, conservation, equipment, DIR, accident analysis, team diving, fitness, psychology, hypothermia, women and technical diving, decompression, dive computers, DPV use in caves, photography, expedition diving, mapping, landowner relations, side-mount diving, mixed-gas diving, rebreathers, and sump diving. The contributors list reads a bit like a who's who of the Florida cave and technical diving scene including: Jill Yager, Jill Heinerth, Lamar Hires, Kevin Gurr, Jarrod Jablonski, Jeff Bozanic, Hal Watts, Paul Heinerth, Brian Kakuk, Forrest Wilson, Ann Kristovich, Jim Bowden and David Sawatzky. The book is generously illustrated with many black and white photographs contributed by a wide variety of photographers including: Martyn Farr, Jill Heinerth, Tom Morris, Richard Nordstrom, Joe Prosser, David Rhea, Dennis Williams and Wes Skiles. The self contained chapters enable a reader to jump to articles of interest rather than read the book cover to cover. As such, the book serves as a very useful cave diving reference book on the shelf. I thoroughly recommend this book as an interesting and most informative read.